Sikhism Beliefs - What do Sikhs believe? The Sikh was initially established by Guru Nanak, and then continued to progress through ten successive Sikh Gurus (the last being the holy scripture, the Guru Granth Sahib). Sikhs follow the teachings of the ten Gurus. 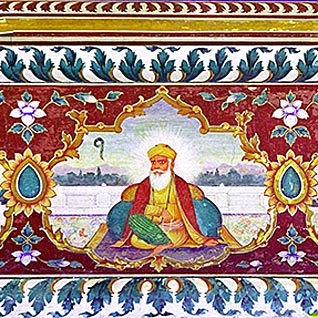 The Sikh holy scripture, the Guru Granth Sahib, contains writings of six of the Gurus, as well selected works from 15 other great saints (bhagats) from the Hindu and Muslim faiths. The tenth Guru, Guru Gobind Singh, conferred leadership of the Sikhs to Guru Granth Sahib (the holy scripture), and the Khalsa Panth (the Sikh community). Sikhs are monotheistic - they believe in one God, who is eternal (Akal Purakh). To be immersed in the virtues expressed in the holy scripture, the Guru Granth Sahib. Sikhs follow the five Ks - shared forms of identification created by Guru Gobind Singh. Each of the five Ks has a symbolic meaning. They contain a main hall (Darbar Sahib) where the Guru Granth Sahib (the holy scripture) is seen. All Gurdwara also contain a common kitchen/canteen (Langar) where food is served to all visitors (both Sikh and non-Sikh). Generally speaking (there are some rare exceptions in India), the Langar serve only vegetarian food, so that all visitors, even those with dietary restrictions, can eat as equals. For further information about what Sikh beliefs, please review our recommended further reading on Sikhism.